In response to HOW TO: Find (good) toothpaste in Japan, some people were wondering about other types of Japanese toothpaste (aside from Aquafresh, which was used as an example in the "how to" post). Can you find whitening toothpaste in Japan? What about natural toothpaste? What other Japanese brands are available? Depending on where you go in Japan, you’ll likely find a varied selection of toothpaste options. Some stores will have more variety than others and larger cities may have a greater selection than what you might find in a small town. Nonetheless, it is always possible to find a myriad of choices online if nothing near you seems appealing. I want to cover some ingredients and things to look for here, as a general guide - you'll want to check the ingredients list to confirm what a particular type has to be sure of what you're getting inside. And, if you're wondering about the basic vocabulary for toothpaste, please refer to HOW TO: Find (good) toothpaste in Japan. *Note: there are other brands by other makers, including natural brands, but the list is far too long to write out here. Yes, whitening toothpaste is available in Japan, though like most whitening toothpaste (at least in the US), it is the abrasives in it that essentially “whiten” the teeth, not peroxide. I wasn’t able to find any toothpaste with peroxide, and think Japan may have strict rules regarding this (if you know anything about this, feel free to comment). Though, you can get your teeth whitened at some dentist offices and/or consult them for at-home whitening kits (as far as I’ve been able to find). If you know differently, feel free to add a comment below. Note that not every toothpaste will contain all of the following ingredients - I gathered these from looking at a variety of different brands and types. Some may be relatively common, such as ethanol. Note: Most Japanese toothpaste does contain fluoride (fluorine). I wrote about it in the previous toothpaste post, but you'll want to look for フッ素 or フッ化ナトリウム. But I've checked, and more often than not I've found it to be included (though you can also get toothpaste without, if you prefer). So, if you’re in Japan and thinking there is no possible substitute for whatever brand of toothpaste you used in your home country (assuming you can’t find it on Amazon, Flying Pig, Foreign Buyer’s Club, or elsewhere), rest assured that you can find toothpaste to match whatever you are currently using, and there are plenty of other options if you’re looking for something new. 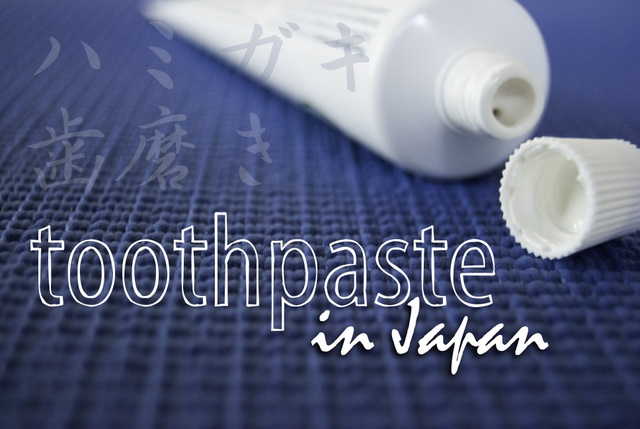 Have you tried toothpaste in Japan? Any favorites?